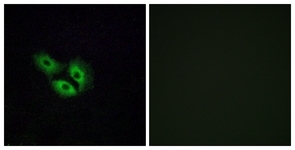 Immunofluorescence analysis of A549 cells, using OR4E2 Antibody. The picture on the right is treated with the synthesized peptide. Immunofluorescence analysis of A549 cells, using OR4E2 antibody.The picture on the right is treated with the synthesized peptide.